Calculate how many yards or how many bags of concrete are needed for a set of post holes by entering the post diameter and hole size. If you’re not sure what size hole to dig, a rule of thumb is to use a hole diameter 3 times the post diameter and 1⁄3 as deep as the post height. See below for more information. Average is $115 per yd3, although your price will vary based on the type of concrete, vendor, and location. Use the post hole estimator to quickly find out how much concrete you will need to set your fence posts. Enter your post and hole dimensions in any units. The calculator will give you the results in cubic yards and number of pre-mixed bags of concrete (40 lb, 60 lb, and 80 lb bags). To ensure that your posts are sturdy for a long time to come, remember to make your holes 3 times the diameter of your post and 1⁄3 as deep as your fence. So, a 6’ high fence needs holes a minimum of 2’ deep. Order additional material to account for settling and spillage. If you have a lot of posts to set, it may pay you to mix the concrete yourself. Or, if you need a cubic yard or more, order mixed and delivered. Concrete contractors can provide estimates for delivering and installing cement for your post project. 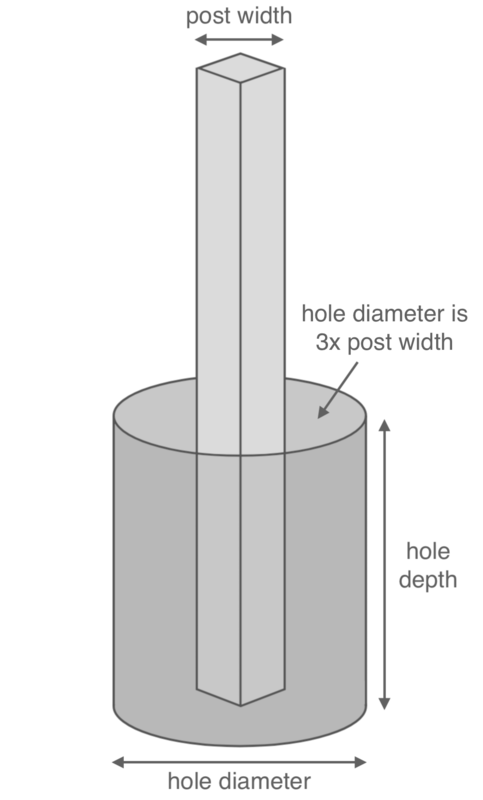 Illustration showing a post hole with a diameter that is 3 times the diameter of the post and with a depth that is 1/3 the height of the post. Concrete is sold pre-made (and usually delivered) by the cubic yard or in pre-mixed bags by weight. To calculate how much concrete you need, you need to know the post size you are going to use and how many posts you are installing. Your post diameter and height determine how big each hole needs to be. As stated above, fence post holes should be 3 times the diameter of your post and 1⁄3 as deep as your post. First, you need to calculate the volume for the post hole. Then calculate the volume for the part of the post that will be submerged in the hole. Make sure all your units are the same! To easily use the table above, convert your units to feet if they aren’t already. Use our calculators to quickly convert Convert inches to feet, convert yards to feet, or convert meters to feet. Use these formulas to calculate volume or, for round holes, use our cylinder cubic yardage calculator. With the volume of the submerged post and the volume of the hole figured out, subtract the post volume from the hole volume and you will have the volume of concrete needed for each hole. Simply multiply that amount times the number of posts to get a total quantity. Don’t forget to add in some extra for spillage and waste. If there are multiple different size post holes that need to be filled, calculate each set with matching dimensions separately, then add the totals together. Let’s use an example to illustrate what we covered above. Let’s say we are installing a 6’ fence. Therefore, 2’ of post will be in the ground. You need twenty (20) 4” nominal round posts. Note that 4” posts are actually 3 ½” in diameter. Use the formulas above for volume. (0.1458’)2 x π x 2’ = 0.1336 cubic ft.
( 0.4374’)2 x π x 2’ = 0.3826 cubic ft.
0.2490 cubic ft x 20 posts = 4.9807 cubic ft. If it is desired to convert the cubic footage to cubic yards, divide the cubic footage by 27. Most concrete suppliers will not sell fractions of a yard of concrete, though it is worth asking about. So, in this example, you would want to buy bags. Using the table below, you would need to buy at least eight 80 lb. bags and one 40 lb. bag (yielding a total of 5.1 cubic feet) of concrete to allow enough for extra. The following table shows the approximate yield of mixed concrete for common bag weights. Consider these tips to ensure your concrete installation goes smoothly. This depends on the application and the climate where you live. Colder temperatures need longer curing times; sandy soils need different shaped holes; more extreme freeze/thaw cycles need higher strength concrete than more temperate regions. Your concrete supplier can advise you on the proper mix to use for your project and region. For ready-mix concrete delivery, there are typically additional fees for delivery, weekend service, small loads, and overtime for long unloading times. Discuss these issues with your concrete supplier ahead of time, so that you have a clear understanding of costs and can plan accordingly. Order extra concrete (overage) for your project. The amount of overage you plan for will vary based on your quantity, but plan for at least 10% overage to accommodate spillage, settling, and grading inconsistencies. This will save you from a bad pour (concrete installed in parts resulting in a separated, weak mass) in the event that your estimates are even slightly off. Finally, digging can be hard, time consuming work. Allow plenty of time to dig all of the post holes for the project before the concrete is delivered or mixed. Mixed concrete that must sit before being poured into place can partially or even fully set. 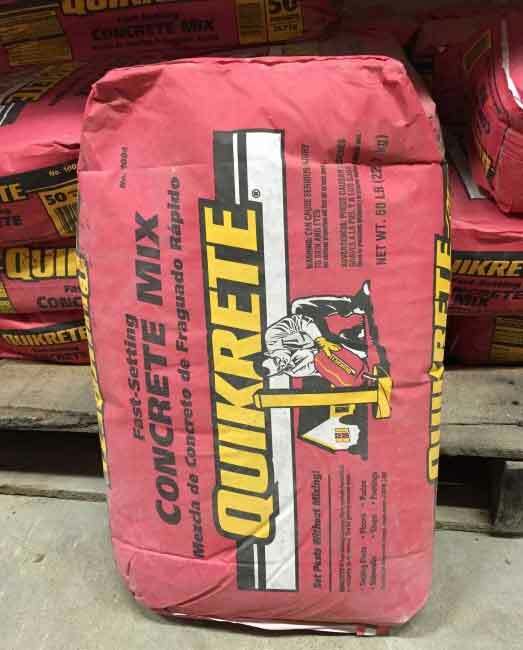 This can result in significant waste from hardened unused concrete or create air pockets and compromised strength from pouring concrete that is too thick. Get hassle-free estimates from local concrete professionals for your concrete project.